Wild sourplums, or mungomba, as the Tonga people call them, taste like pucker maraschino cherries infused with almond. They have a flavor so unique and a color so bright, my imagination went into overdrive when my assistant, Maggie Mundia, first brought me a basketful, collected by her father and younger brother from the bush on the farm, last December. The large sourplum, or Ximenia caffra, is a shaggy, spiky shrub-like tree found throughout southern Africa. Birds and butterflies love the tree as much as humans, which isn’t surprising because its benefits are numerous. High in vitamin C and potassium, the sourplum also contains lots of protein. The oil in the seeds, which is unusually high, is extracted and used to soften skin, as well as animal hides. The Tonga people use the sourplum leaves as a remedy for many ailments, including diarrhea, worms, tonsillitis, and conjunctivitis. Powdered sourplum roots, meanwhile, are used in unguents and added to beer as an aphrodisiac. Starting the process of making the wild sourplum syrup. In this household, I turned my bounty into a wild sourplum syrup. I have used it in savory dishes like my Roast Duck with Wild Sourplum Sauce. In the last couple of weeks I’ve been experimenting with the sourplum syrup in ice cream. For all who tried it — there were five of us — the recipe was raved about but not one person could describe its flavor. “You can’t,” Chris said. “There just isn’t anything else with which I can compare it.” I then asked my Zambian assistants what they thought of the flavor. Each one loved it but also struggled to articulate what they tasted, or process the fact that this was the same fruit they ate raw, plucked straight from the tree at Christmastime. Straining out the syrup from the boiled fruit. 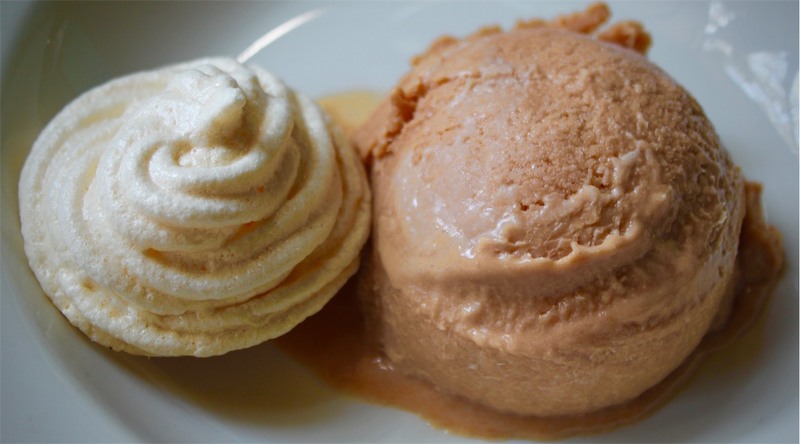 The ice cream turned out to be the color of caramel with a touch of its flavor about it. I used little sugar in the custard, knowing the syrup had been sweetened. This gave the ice cream a definite sweet and sour overtone which, having been made with a creamy egg custard, made it dense and rich. I decided to pair the ice cream with meringue to accentuate the sweet and sour effect even further. I used an egg custard base with lots of cream. The custard, after the wild sourplum syrup was added. Notes: For my readers who don’t live in Africa, any sour red fruit, like cranberries, turned into a syrup will work well with this recipe. For my American readers, Ximenia americana, or tallow plum, is found in Florida and other dry, semi-arid areas through the south and west. Ximenia americana also grows in southern Africa, although I am yet to taste the fruit. Cup-for-cup measure, equal parts sourplums and granulated sugar *Quantities will depend on how much you forage. I filled a large saucepan with fruit and rendered about a 750ml-bottle and a half of syrup. Meringues are piped and ready to be cooked in a low oven. Rinse the sourplums well in cold water and drain. Mix the fruit and the sugar together in a heavy-based saucepan, cover with water and bring to the boil. Turn down the heat and simmer until the fruit has softened and browned, and the juice has thickened to a syrup, about 2 hours. Remove from the heat, strain the fruit out of the syrup, cool, and set aside, or preserve, until ready for use. When the custard is cool whisk in the sourplum syrup, ensuring it is well-combined. Pour into an ice cream maker and after the cycle is complete, transfer into the pre-cooled ice cream container and place in the freezer until ready to serve. *Click here for freezing instructions if you don’t have an ice cream maker. While the ice cream is being made, preheat the oven to 150/300 degrees. Line a baking tray, and lightly grease with coconut oil. Add the sugar, a heaped spoonful at a time, beating after each addition. When finished add the vanilla extract and beat one last time. Transfer the meringue into a piping bag with a fluted nozzle. Pipe the meringues into shapes of your choice. Be sure to leave enough space for each meringue to expand. Place in the middle of the oven and immediately lower the oven setting to 120/250 degrees. Cook for 45 minutes, then turn off the oven and leave the meringues inside to cool completely. *This method stops them cracking. When ready to serve, arrange one of the meringues with a scoop of wild sour plum ice cream. Wild Sourplum Ice Cream with Crisp Meringue. Brilliant. I remember how tart they were when eaten off the tree. Clever dish Annabel. I think the Chinese here in hong Kong use a sour plum. Thank you, Pete. It’s unquestionably the best ice cream flavor Chris and I have ever tasted. Move over Ben & Jerry’s, haha! Great post with beautiful photographs and detail. Looks (reads) delicious! Very inspirational Annabel, your imagination seems to have no bounds! Oh, you’ve always got such interesting things! I’ll have to just imagine what the sourplums taste like, and what lovely meringues. Thank you, Michelle. You can find a version of the wild sourplum in the United States. It grows in the scraggier parts, I think. It’s not as red and has, by all accounts, a gazillion nicknames. The Latin name is Ximenia americana. Oh I wish I could taste these sour plums! You’ve certainly turned them into a beautiful dessert! There is a plum that only grows in northeastern France called Mirabelles, and they are supposed to also have a unique flavor. I picked them off the trees when I was young, but don’t really remember what they tasted like, sadly. As I said in my post, our wild sour plums taste like a pucker maraschino cherry with a hint of almond to it. They are absolutely yummy! Thanks, as always, for stopping by, Chef Mimi!